The SGE (Sungkok Global Exposure) program that was promoted for the summer vacation from July 4th to 16th was offered for the purpose of improving overseas experience among the students. Especially, only 40 students from the College of Social Sciences were selected and it commenced the departure of SGE program. Under the guidance of Professors Chun-ryeol Ryu and Jun-hyeong Ji in the School of Communications, the students took lecture on the history, society, and culture of Mongolia in the ‘Ulaanbaatar University.’ Also, the students participated in various programs that enabled the experience of local living as well as carried out a project to produce promotional video for Ulaanbaatar University and its affiliated kindergarten, elementary, middle, and high school. Ulaanbaatar University was founded in 1995. As one of the representative universities in Mongolia that is composed of about 2,500 undergraduate students, 130 graduate students, and 120 professors, it currently has MOU with Kookmin University. The Chinggis Khaan International Airport where 40 students made their first step on July 4th was located in an area with altitude of approximately 1,000m. As if greeting the visitors from far away, cool breeze welcome the students. With a buoyant spirit, the students headed towards the very crowded downtown of Ulaanbaatar. There were used Korean vehicles in the street and it was easy to see streetlights of Namyangju City and banners advertising Korean products. Buildings under construction and apartments were lined up and stuffy sand wind blew. On the unpaved roads where traffic system was not distinctively settled, men and cars passed together. It looked unfamiliar but such was said to be due to the history of Mongolia that went through socialism in the past. Today, it is rapidly changing to liberal democracy. 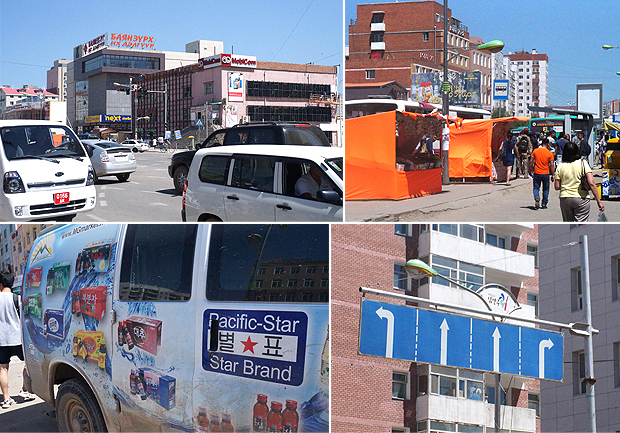 The Sükhbaatar Square was located at the central part of Ulaanbaatar and it is similar to Gwanghwamun of Seoul. Centering the statue of Genghis Khan that stretched the giant right hand towards the sky, there were the Opera House, Museum of Modern Art, and Historical Museum. From 20 minutes away heading to the south from Ulaanbaatar, the War Memorial Hall was located at the peak of a barren mountain. This was the place to commemorate the defeat of the Japanese Kwantung Army by the Allied Forces of the former Soviet Union and Mongolia in 1230s. Along the stairs, magnificent panoramic view of Ulaanbaatar was unfolded and the students let out exclamations of delight at the spectacular view when taking photos surrounded by the vast sky and green field. There are Ulaanbaatar University, affiliated kindergarten, elementary, middle, and high school, and dormitory inside the Ulaanbaatar University. 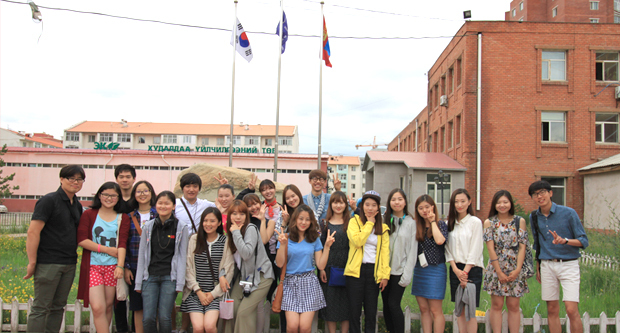 The 40 dreamers toured around the Ulaanbaatar University and listened to the racial and historical correlation between Mongolia and Korea through a meeting with President Deok-gyo Oh in the Ulaanbaatar University. The president said, “Mongolia and Korea are very similar in terms of genetic, linguistic, and geological aspects” and explained the reasons why Korea had to promote amicable diplomacy with Mongolia. After the meeting with the president, the participants learned basic Mongolian language to understand Mongolia better. Professor Boshugang taught basic conversation through a session called ‘Survival Mongolian.’ Including greeting ‘Сайн байна уу (Senbeno: Hello),’ appreciation ‘баярлалаа (Bairulla: Thank you),’ and asking one’s name ‘таны нэр хэн бэ? (Ternir Ham Be: What is your name? 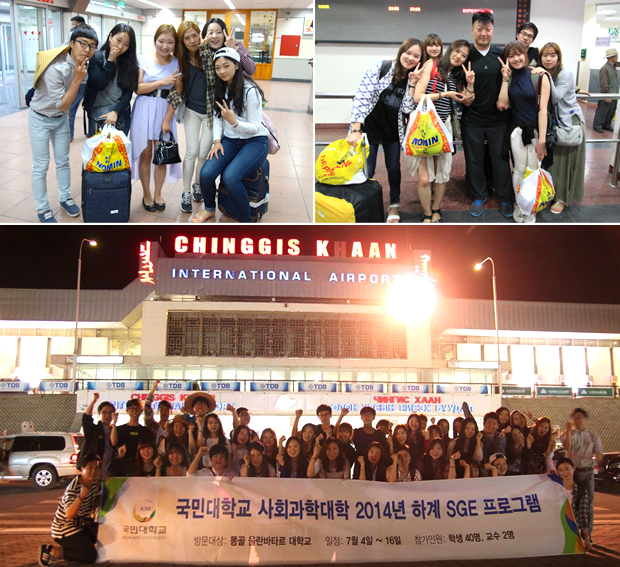 ),’ the 40 students got closer to Mongolia while learning various expressions. After the education on Mongolian language, the promotional video, which was the major purpose of this SGE program, was planned and promoted. To produce promotional video that would be used for Mongolian students, the students from Ulaanbaatar University speaking both Mongolian and Korean helped in the interpretation. The 40 participants exchanged greetings with the students from Ulaanbaatar University and had a group meeting for PR video planning. The 3 groups including the kindergarten team composed of Teams 1 and 2, elementary school group composed of Teams 3, 4, and 5, and middle and high school group that was composed of Teams 6, 7, and 8 produced PR video. In order to practice the sharing spirit for the neglected people in Ulaanbaatar, the students left towards ‘Ger town.’ Since there was a tradition to bring a small gift when visiting a ‘Ger,’ the students prepared flour and snack as a gift. From the path to the ‘Ger town,’ it was possible to guess how the town people lived under poor surroundings. Most paths were too narrow that it was hard to go riding a car and since there was no sewage system, the rain poured yesterday formed puddles. Such muddy path was difficult to walk through. In the Ger town, the lowest and darkest spot in Mongolia, the bright and shining hope of Mongolia was seen. Through the people there, the students expected positive ‘tomorrow’ in their future. Naadam Festival that enabled easy experience of Mongolian living and traditional culture is an event enjoyed by both locals and foreigners. In order to join the festival, the students headed to the outskirt of Ulaanbaatar after 2 hours of driving. 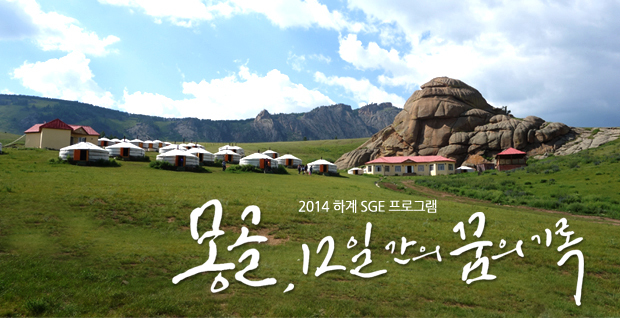 The place where they arrived was totally different from Ulaanbaatar, the previous stop of the participants. The wide meadow and endless sky that you can easily imagine when thinking about ‘Mongolia’ have drawn everyone’s attention. Naadam Festival is an event held from July 11th to 13th on the anniversary of the Mongolian revolution. 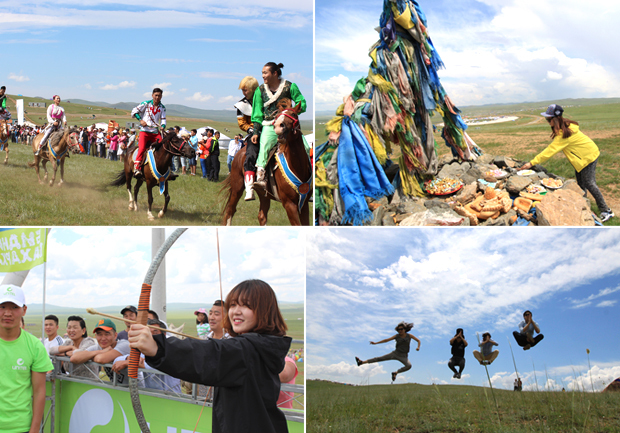 ‘Naadam’ means a festival originated from the word ‘наадах: Naadakh (to enjoy, play)’ and the official name of the event means ‘the three games of men.’ The 3 games consisting of Mongolian wrestling, horse racing and archery are the major events of the festival. The horse racing called ‘Morinii Uraldaan’ was held at the place visited by the students. Horse racing is a traditional competition of the Mongolian nomad succeeded from the Bronze Age and by racing for about 15~30km, it is said to test the perseverance of the horse and horse-rider. There is a saying, ‘Nomad is born from the saddle.’ As this saying proves, the look of the horse racing by young children was spectacular. The students stayed a night in the Gorkhi-Terelj National Park, a place that became more popular with its appointment as UNESCO World Heritage. The Gorkhi-Terelj National Park is located in an area about 1 hour away from the Ulaanbaatar downtown. Including gorges surrounded by mountain, strange rocks and bizarre stones, and widely spread meadow, the Gorkhi-Terelj National Park is considered to be one of the renowned attractions in Mongolia. 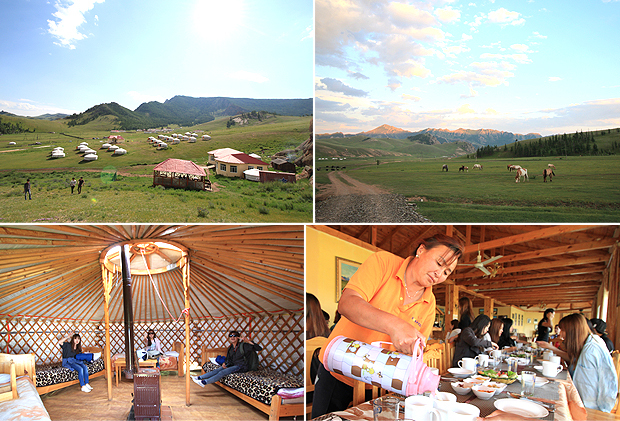 While staying in ‘Ger (traditional mobile house of Mongolia)’ for a night, the students experienced the traditional culture of Mongolia. The climate of Mongolia is characterized by broad daily temperature range so in order to maintain temperature at the meadow during night when temperature drastically drops, there was a heater at the center of Ger. When the heater was on, the temperature was warm enough as if being in a sauna in Korea. The heat emanating from the heater lasted long so the warm temperature is maintained until the next morning. In the Ger town, people provided food for the visitors and the students were given food called ‘Horhog.’ Horhog is traditional Mongolian food made of lamb and vegetables that are prepared using heat from stones. This food is known to be served during the arrival of an important guest. Another magnificent sight of the Gorkhi-Terelj National Park could be seen when night came. It was the night sky packed with countless stars and these embroidered the sky, appearing as if falling onto the wide meadow. There were no skyscrapers and lines of streetlights at the meadow of Terelj so just by slightly looking up, various constellations learned in the lecture, such as the Big Dipper, Cassiopeia, Altair, and Vega, were easily found. As dawn came, the students went to the hill holding their sleeping bag and shared stories of their journey in Mongolia. The students consider it to be their most fascinating night ever. The screening of the promotional video that was the highlight of this SGE program was promoted on the last day before departure. The kindergarten group reflected the concept of ‘kindergarten that is desired by children and parents’ in the video by using the format as picture journal. The elementary school group produced video with a theme of ‘faith, hope, and love,’ the educational philosophy of Ulaanbaatar University while the middle and high school group came up with a unique method that showed the facilities and educational approach of the school from a first-person point of view. After the screening, the time to express appreciation to Professor Jun-ho Yun who was Director of Cultural Exchange and Cooperation Division and supervised the itinerary for the students, instructor Sirchima, and instructor Gyeong-jin Jeong who assisted the students in Mongolia. Also, there was time to present the rolling paper of each group, and the video message of appreciation for Professor Yun as well as Professor Chun-ryeol Ryu and Jun-hyeong Ji in the School of Communications was shown. The participants made their farewell to Mongolia after their 12-day journey. The students’ mind when heading again to the Chinggis Khaan International Airport was as heavy as their baggage. As if sharing their sadness, it rained as well. Before getting off the bus, the professors cracked a joke, “Those who want to stay in Mongolia may stay in the bus” and every student answered “We will!” Likewise, the students were sorry to leave Mongolia. The 40 participants and their new Mongolian friends who came to the airport to say goodbye promised to meet again next time, shedding tears as they bade farewell. The dreamers boarded the plane, leaving the 13 days of journey in Mongolia behind. As the plane takes off, the students reminisced seeing photos and recording memories in Mongolia. After a 3-hour flight, the plane arrived at Incheon International Airport and the first SGE program was successfully completed. There are times when the surroundings are poorly seen as what we have is too big. Maybe it was the look of the students before visiting Mongolia. However through the short yet meaningful meeting and communication in the unfamiliar land of Mongolia for 12 days, the look of the students has changed. The meaning of ‘dream’ among those in their 20s is too huge, too small, or nothing so we barely chase after a dream. 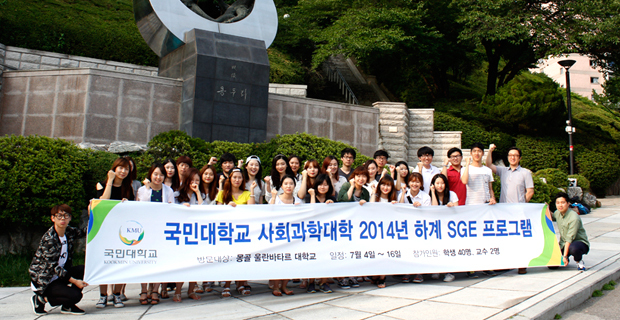 Nonetheless, the view of the 40 students who participated in this SGE was different. Their attitude to show off what they have was changed into consideration for others. Such positive change is reflected in the video that they perfectly produced within a short period of time. Based on the past experiences in Mongolia, the student participants may change the path of their dreams or passionately pioneer their lives toward their own dreams. Mongolia that was experienced in the journey of the 40 dreams was engraved in various shapes into the students’ heart. Now is your turn. There will be more to come in SGE program so why don’t you join in the unknown journey for your future?